Educating in the 21st Century: No Phones, No Cameras, No IPods...no problem? One evening late last week, I visited a high school from a neighboring district. As I walked through the hallways I noticed two recurring signs. Unfortunately the camera on my smartphone is not the best, but you can see the pictures and captions below. 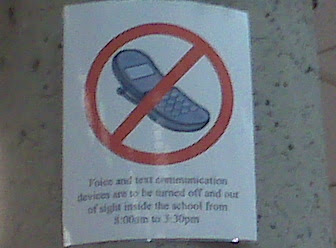 "Voice and text communication devices are to be turned off and out of sight inside the school from 8:00am to 3:30pm." 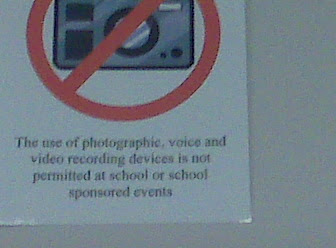 "The use of photographic, voice and video recording devices is not permitted at school or school sponsored events"
I was not in the school during regular school hours so I was unable to observe whether students respected the policies and how the staff responded to students who violated these policies. Although I'm not certain, I don't believe these are district policies. I believe these policies originate from school-based decisions since I have not seen these signs posted in other high schools within the same district. We have an active group of photography students at Delta Secondary who can be regularly seen taking photos in different areas of the school both during and outside of regular school hours. How would a photography class exist within this type of environment? Teachers at many schools such as ours are exploring how these mobile devices can be used in a productive manner in the classroom to enhance student learning. Some students have been using their smartphones as a research tool, some for text polling and others to listen to student-created podcasts. A recent article titled Mobile goes Mainstream points out many educators' changing perceptions to accept the use of mobile technology in the classroom. The fact that "Voice and text communication devices are to be turned off and out of sight inside the school" but appear to be acceptable outside of the school points to a disconnect between the worlds inside and outside of school. Isn't it a school's responsibility to help students learn to regulate the appropriate use of these mobile electronic devices? Shouldn't we be exploring when, where and how students can use their electronic devices in positive and productive ways? If students are so engaged in using their electronic devices during class time, what does that say about their level of engagement in what they should be learning during class? Having said all that, I realize that these devices can potentially be a significant distraction for students. I also recognize that incorporating mobile devices is quite a leap from traditional models of education and for this reason can cause many of us some discomfort around the idea. Is there a magic policy around mobile devices that every school should apply all the time? Definitely not. But, I do believe there is a time and a place for everything, electronic devices included. What we all must acknowledge is that these devices are part of the world and their use is only going to grow in the coming years. As much as we may not yet be fully comfortable with how to implement the technology into our classes in a way that supports student learning, we must take some risks and try some innovative practices in an attempt to make our students' lives in school more relevant to their lives outside of school. I invite your comments and would love to hear ways in which your students are using mobile technology to support their learning. We have an official policy around the use of cell phones, which says that they should be in a student's locker during the day. iPods, cameras, etc... though are all okay, as long as they are being used appropriately. The unofficial policy on cell phones is, you can have it on you as long as it's not a distraction. Don't use it to text your friends while you should be doing something else. The number of times I've seen students use their cell phones in appropriate ways is about the same as the number of times I've caught kids sending text messages when they should have been focusing more. It's hard because really, you are sending a different message when you tell kids not to text message. "Don't communicate with your friends unless I say so," when the message should be "use your communication tools at appropriate times." Have you watched our parliament meet lately? Look into the backbenchers and watch what they are doing. Look into a TED audience... What would you see? Have you ever used a device in an appropriate way in a meeting? What about an inappropriate way? The job of modern teachers remains remarkably similar to those of the past... Teach humanity, appropriate skills and creativity, and the occasional facts of interest. Landlines, TVs, and PCs were all considered distractions in the classroom at one point too. Ryan, I believe what we presently refer to as 'innovative' when it comes to the use of these devices in learning, we will gradually see become more mainstream in classrooms. As we all know, the adoption curve in education tends to take time but as ideas spread I'm sure more educators will come to embrace the power of mobile technology. Personally, I find I am tuning into the 'backchannel' more often when I attend meetings and pro-d events. I admit I have been distracted at times also so it is up to me to self-regulate so that I can participate in meetings/events in different ways. David, I agree we send mixed messages to students when we tell them to use their phones 'appropriately' but then tell them they can only their phones when we authorize them to do so. Johnny, I checked out #eblock. It's great that your English teacher is engaging her kids in a way that is relevant to them. We have had a few teachers experiment with Twiducate and TodaysMeet with varying degrees of success. What we are finding is the level of success REALLY depends on the structure of the lesson. More recently, one of our classes has created a class blog. I invite you to check it out and comment http://ladneralternate.blogspot.com . I'm sure the students would appreciate it. Thanks to all of you for your comments! I'm looking forward to keeping the conversation going. Most definitely Tyler! Not in the least am I advocating for this type of behaviour. This is another example of why it is important that schools work with students to help them understand and SHOW them what is 'appropriate' and what is not. The only way for students to learn 'appropriate use' at school is for us to allow them to have the devices with them, engage them in positive uses and work with them if they make mistakes. Banning mobile devices would mean we are shying away from formal and informal student learning opportunities. I have to be honest - I have NO idea why iPods are not allowed in schools... not to gloss over the fact that there are podcasts, etc., but I think we have heard those arguments ad nauseam. But what about the fact that music is a real expressive force to be reckoned with? Kids look up to pop artists - they listen to the radio - shouldn't we teach them the power of music? And not just the music in band/orchestra/chorus, etc. Modern music. So, if you were discussing bullying, ask kids to find a song that they like that deals with either the emotions associated with bullying, or with being an outsider. Consider the power in compiling these songs, and asking students to listen to them and just FEEL. Or write, or draw. Music = emotion. Not to mention the fact that music can actually influence your bio-chemistry. This is why there is music in movies. Or why we listen to our iPods at the gym. Certain music can help kids focus. Put kids in a happy mood. Make a class soundtrack of "happy songs" and "calm songs" and then play it while they are working on something. Or better yet, LET THEM LISTEN TO THEIR OWN. The results are amazing. There are so many benefits out there, I wonder why more schools are not abandoning these antiquated policies? Banning things leads to the "forbidden fruit" syndrome - kids will do it anyway. How many hoods to kids have on in class? Or their sleeves on their ear? Yeah, there are some headphones under there... allowing students to be who they are will lead to less fighting with them. Thanks for adding the music perspective to the conversation. Music can play such an important role. Once again, it comes back to HOW students use the tools, assuming they are granted the permission. In the upcoming school year we will be introducing a new Digital Design Program that includes coursework from a variety of subject areas. Digital music composition will be one area that students will have the opportunity to engage in. Other opportunities include Digital Media Development, 3D Computer Animation and the Business of Digital Media. Mobile technology will definitely be applied in these areas! Why are some schools continuing with antiquated policies? Well, as much as I'd prefer to see all schools embrace the technology, I recognize that change can be challenging. In order for us to expect educators to progress, we must provide them with the means and support in order to do so. Simply updating a policy does not mean we are truly taking any meaningful steps forward in terms of teaching and learning. In fact, changing a policy without providing the necessary support would mean we are hanging our colleagues out to dry. Sometimes, people may agree that a policy is no longer relevant, but in the absence of knowing HOW to move forward, it remains easier to maintain a traditional policy that at least they feel comfortable with. Ultimately, progress in the classroom should be what drives our policies rather than the other way around! I know where you are coming from, but would like to counter that the first step is giving permission. Sadly, many people have really great ideas, and are just waiting for permission. Progress can't be made without the permission to seek it, and that can't happen without the policies being abolished in the first place. Then, people are free to come up with ideas on how to implement it. If you have a few excited teachers spreading ideas, hopefully (though I recognize that this doesn't happen nearly as much as it should), more people will jump on the bandwagon. It comes down to starting with something small - let those teachers who want to let their students listen to music as they are working. Then, see where it goes from there... people just need to be given permission to experiment. My texting in high school was not with a phone but rather handwritten notes, intricately folded and passed along in between classes. Is this any different from texting? I say no. I also say that students have most likely been engaging in "off-task" behaviours since institutionalized education began during the industrial revolution. Let's face it, school is often boring and fails to capture the interest of many students. A well designed curriculum and thoughtful lesson plan will be far more effective in reducing text messaging in class when compared to a forgettable sign posted in the hallway. Elizabeth, you're right! Granting permission is crucial. Providing the support teachers require in order to incorporate the tech into their classes is equally as crucial. Ironically, I think another important idea is granting the 'permission' to take risks and possibly fail. As a teacher, I recall initially being afraid to fail in front of my students. Over time, as I experimented with new ideas I realized that my own learning was increasing and my students' learning was increasing also. In my present role as an administrator I openly admit that I am learning along with my colleagues and students. I emphasize to the colleagues that I'm working with that some of our ideas may work well and some may require further tweaking. Regardless of the outcome I always try to be present in the classroom when the teacher is implementing the new idea. Ultimately, if things work well, I credit the teacher with a great idea and thoughtful planning. If things don't go so well then I accept a fair share of responsibility and tell them we need to reflect and rethink together. Kelly, I couldn't agree more! Rules and policies alone do not change behaviour. Modeling appropriate behaviour, engaging students in positive uses of technology and helping them learn from mistakes is a much more effective way of affecting student behaviours. These devices already integrated into most of our lives. I agree with your statement that there is a disconnect with the real world and school. However, I see this with many other policies in schools. It is insane to think that in many careers these days they would tell their employees the same. They wouldn't. Most jobs want to make sure you're easy to get a hold of and often will give you a mobile device to ensure this. We need children to be able to communicate effectively with these devices and problem solve. Instead, so many missed opportunities to guide students with the tools they are already using are missed. I would like to make the statement that as a child, adolescent, and teenager "anything and everything" is a distraction. Sometimes, the sun shining outside on a nice day was a distraction for me or the cute boy or bully. Students are distracted not by the device but because schools have made learning a chore and tedious. It is no longer fun, exciting, or hands-on. Instead, many classrooms force children to sit in desks for hours doing bookwork silently. In this unnatural and unhealthy setting I think distractions are expected. When we begin to have children take the reigns of their learning, have input in what they choose and how they choose to learn then that is how we limit distractions. We engage them.